We Happy Few: There’s so Much Joy in Forgetting. Kickstarter, Early Access and all the other tools that enable developers to get an idea in front of players before it’s fully formed are both a blessing and a curse. They’ve brought a lot of ideas to reality that otherwise wouldn’t have happened otherwise, bringing us unique game experiences that have helped shape the medium for the better. On the other hand they have also seen many great ideas fall prey to the tyranny of the crowd or the popular idea of the day. 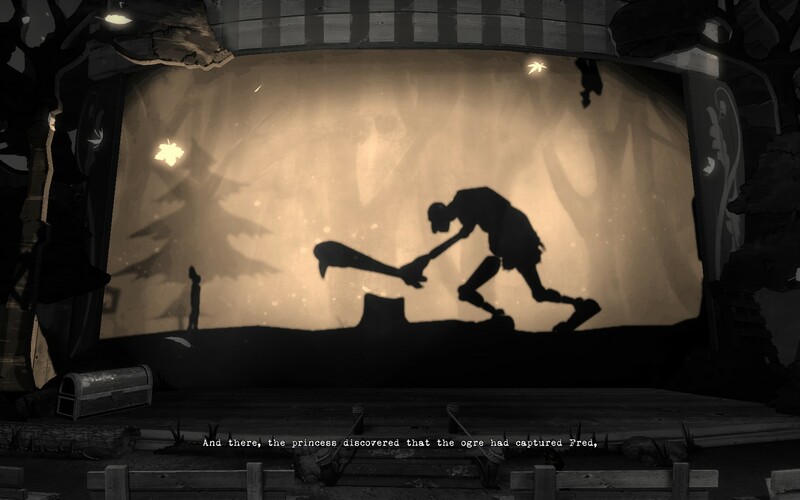 That is the fate that has befallen We Happy Few, a game I Kickstarted back in 2015 as it is not the game I remember backing all those years ago. The mechanics that drew me to the it initially, taking a new approach to how stealth games could function, and the intriguing narrative they sought to craft were usurped by a procedurally generated survival sim. That’s not what I, nor I think a lot of their original backers, were seeking to support. You are Arthur Hastings, a redactor working for the Wellington Wells’ Department of Archives, Printing, and Recycling whos job is to censor and approve old news articles to make sure that only good news makes it to the good citizens of your town. In completing your job though you come across an old news article of you and your brother and suddenly it dawns on you: the whole town did a Very Bad Thing a long time ago. You refuse to take your joy and quickly discover that the town of Wellington Wells isn’t all it appears to be. Not long after skipping your prescribed medication you’re chased out of the town and find yourself among the downers, the ones who can’t or won’t take their joy. You resolve yourself to find your brother by any means necessary, even if it means remembering what that Very Bad Thing was. We Happy Few’s graphics are heavily stylized, taking a lot of inspiration from other retrofuture games like Bioshock. The game’s visuals are at their best in the city when you’re on Joy, the vibrant and oversaturated colours really selling the idea that none of this could possibly be real and it’s all a drug induced fever dream. Unfortunately the first few hours of the game have you out in the more drab areas which are nowhere near as interesting visually. The graphics are also more inline with previous generation games, something which isn’t completely unexpected given how long it has been in Early Access. It’d probably be a little less noticeable if the procedural generation was a little more varied with the supposedly “random” bits usually consisting of the same building blocks and NPCs repeatedly. All this being said it does run particularly well, even with a lot of things on screen, so it’s got that going for it at least. From a gameplay perspective it’s neither a true survival game nor a traditional single player RPG as it takes cues from both. You have your usual survival mechanics like food and water but they’re not critical to keep up, you’ll just have a few negative buffs applied to you if they run out. Progression comes in the form of a very traditional XP and talent system with weapon and gear upgrades coming from crafting. The world you’ll be running around in is mostly procedurally generated with certain fixed areas for story missions and the like. There’s a small smattering of open world things around as well with random encounters and side missions scattered around the map. All in all whilst it’s a pretty comprehensive game there’s a noticeable schism between the handcrafted parts and the world that the procedural engine generates. Honestly there’s large chunks of the game I think that could be wholly abandoned which would make for a much tighter experience but unfortunately I don’t think that’s ever going to happen. Combat takes the form of the typical first person melee style, along with all the issues that come along with that. All your weapons have durability as well, meaning that you’ll need to carry an array of different implements to ensure you can whack your way out any situation you find yourself in. The game is most certainly designed with stealth in mind so it’s somewhat understandable that the combat didn’t get as much love as it should’ve. It does make for an unfortunately frustrating experience when you don’t have much choice in whether you can fight or not. On the plus side though you can walk/run faster than anyone else in the game so realistically there’s not much stopping you from simply legging it to a safe spot if you ever find yourself in a pickle. The stealth system is much better than other comparable games although given it was meant to be the game’s flagship feature it is a bit of a let down. The traditional stealth mechanics all work as you’d expect like hiding in tall grass, getting out of line of sight and NPCs being able to be distracted by thrown objects. The social stealth system however is the real disappointment as it was originally billed as a balancing game of using Joy in order to blend in appropriately. The long and short of it is that you don’t really need to take Joy at all unless there’s a specific progression blocker for it. You can freely walk around the towns off your joy and no one will say anything and the cameras that detect you can be easily run past without causing too much of a fuss. I had hoped that once I got back into the town proper the game would start to pick up a bit with the additional mechanics at play but unfortunately it didn’t. Progression comes in random bursts, typically at the end of story missions. Doing anything in the open world doesn’t seem to reward you with much as I never appeared to level up when I was traipsing around so in the end I just gave up on it. Crafting is also a bit of a crapshoot too as whilst you can carry a lot there’s not a lot of useful things for you to make. There’s blueprints for you to track down but honestly I never found anything worthwhile in them. That, combined with the utter lack of accessible stashes, means that you’re often carrying around a ton of useless stuff that you feel like you need to hold on to “just in case”. I toyed with the idea of tracking down a mod for the game to lift the inventory limit but frankly at that point I was already done with what We Happy Few had to offer. The story was probably the standout part of We Happy Few which is a shame that it wasn’t given a better vehicle to shine. You see with all the running about between missions through repetitive procedurally generated terrain the pacing of the story gets completely lost. There are numerous memorable scenes, even in the game’s opening moments, but they’re then lost when it takes you half an hour of wandering about to get to the next small tidbit. The voice actors should be commended for the incredible job they did with making the characters come alive as it was during those moments that I really started to feel like there was something to like in We Happy Few. Maybe I should’ve just watched a stream of the game instead. We Happy Few is a game that started out with a great concept that unfortunately failed in its execution. The grab bag of mechanics coupled with the procedurally generated open world meant that there was no real single driving force that pushed me to keep playing more. Instead I felt like there was just too much time between the games stand out moments, taking a bat to the story’s pacing and, most unfortunately, my enjoyment of it. I really do hope that some of the remaining games I’ve Kickstarted don’t go down a similar path as I’m beginning to lose faith in my ability to pick good ideas when they’re at such a nascent stage of their development. Hopefully I’ll be proven wrong soon. We Happy Few is available on PC, Xbox One and Playstation 4 right now for $84.95. Game was played on the PC with 3 hours of total playtime and 8% of the achievements unlocked. The indie dev scene seems to go through periods of obsession with different genres. In the past it was with platform puzzlers as it seemed that every other week brought to me several new titles attempting to put their own twist on the tried and true genre. More recently it seems to have shifted to survival horror as many seek to replicate the success of DayZ. 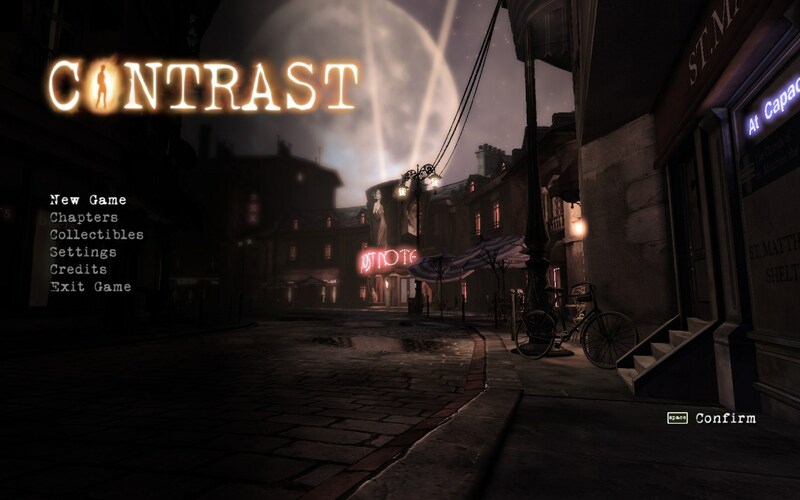 So when Contrast, a platforming/puzzler from Compulsion games, I felt a distinct twinge of nostalgia, harking back to the indie renaissance that was built on games such as this. Like many from that time it’s taken the puzzler/platformer genre and placed its own unique style on top of it resulting in a game that’s quite interesting, even if it has its faults. It’s not quite clear who, or more importantly what, you are when the game starts but all you know is that only a small girl, Didi, can see you. In fact this bond seems to be somewhat mutual as you can’t see anyone else but her and the shadows of others that are in the room with you. You and Didi seem to share a bond however as she’s always getting into mischief, usually with your assistance, much to the chagrin of her mother. Still, Didi’s mother tries hard to support her, hoping to rise to fame as a wonderful singer and actress. Everything starts to change when Didi’s deadbeat father comes back into the picture, promising to make everything right. 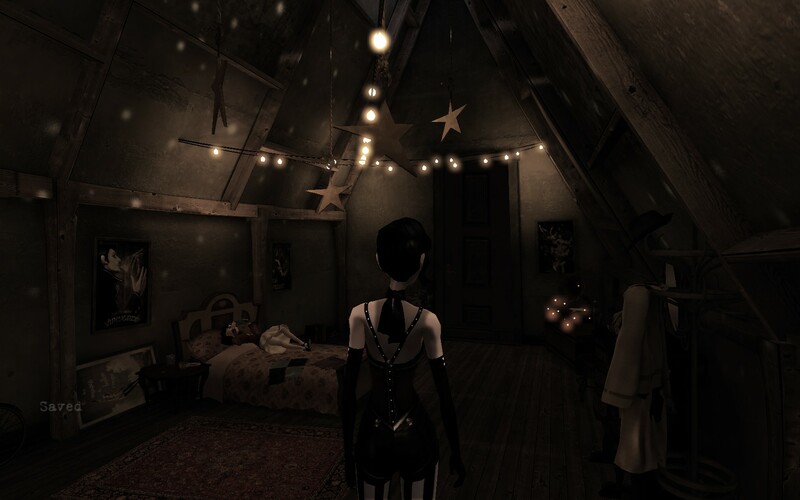 The art style of Contrast feels like you’re in the mind of a child with many typical elements, such as houses, having a very whimsical nature to them. It’s all heavily inspired by the art deco movement of the 1930s and 40s with many of the environments having a really distinct BioShock-esque feel to them. They do feel a little dead and empty however which I do believe was done deliberately however it means you feel compelled to not stay in one area for too long, even though the game tries to encourage you to explore. Potentially this could have been solved by adding in more light sources that had shadows walking past it which wouldn’t seem out of place and would make everything feel a little more alive. As I alluded to earlier Contrast is a platform/puzzler that has an unique mechanic to spice things up a bit. The puzzles are all fairly basic in nature, usually consisting of getting yourself from one place to another or moving an item into another spot that’s not exactly obvious when you first start out. Contrast’s twist however is that when a wall is lit up you can “shift” into it, becoming a 2D shadow on the wall that allows you to move in ways that would be impossible otherwise. This leads to some rather intriguing puzzles where you’re always looking for where the source of light is and how the shadows you can create will help or hinder you in your goal. There’s also a set of collectables called “Luminaries” which are hidden in various locations throughout the game. They function as an exploration mechanic as well as a kind of in-game currency to progress past certain obstacles. Their presence isn’t fully explained however, although Didi is aware of them for some reason, so the motivation to collect them really only comes about if you’re a natural explorer or you happen to see one that isn’t far out of your reach. Indeed there was only once when I didn’t have the required luminaries on me to immediately continue a puzzle and then it took me less than a couple minutes to find the requisite number. Unfortunately whilst this mechanic is indeed novel it suffers heavily from glitchy behaviour. True flat surfaces with light projected onto them appear to work quite well however anything with a ridge or a bump in it, like the numerous columns that dot the landscape, have a tendency to shift you back out of the shadow plane. It’s hard to tell if this is expected behaviour or not as you can walk through them, some times, and you can also blast past them again only randomly. The shadow detection itself can also get a bit buggy as Dawn’s hitbox appears to be significantly bigger than the character model, leading to some puzzles either being more complicated than they need to be or being trivialized. Indeed there were quite a few puzzles where I figured I’d be restarting from the checkpoint again only to find myself standing on air next to the ledge I was trying to jump onto. Whilst I was somewhat appreciative of this at the time it does mean that the game doesn’t function as you’d expect leading to some rather undesirable behaviour. Worst still there are many places where you can find yourself caught in the environment for some inexplicable reason and while I never had to reload to get unstuck it certainly didn’t endear the game to me when it happened. 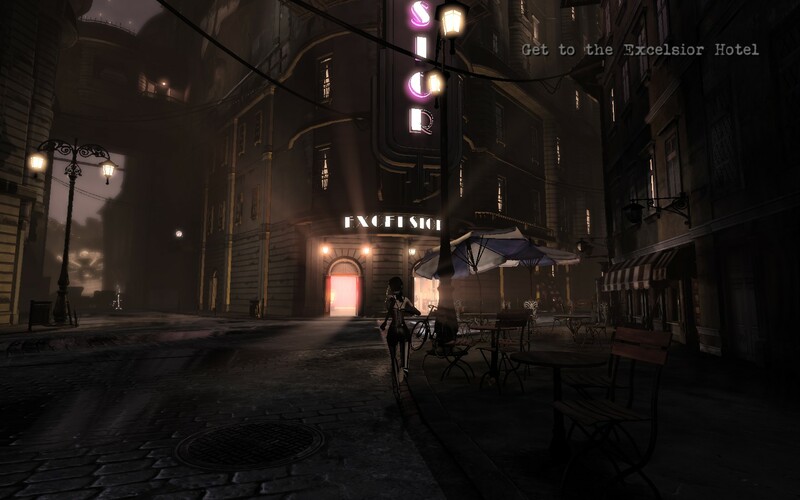 Contrast’s story, whilst clichéd, does help to smooth over some of the more rough edges of the game. The majority of the voice actors are great with the notable exception of Didi who’s lines seem to be heavily disjointed between sentences. The music is quite good, suiting the art deco environment aptly. Whilst it might not have the depth of other indie titles it certainly has a little bit of charm to it with everyone being able to identify with the idea of giving someone a second chance. Contrast is a unique concept, filled with brilliant ideas that are unfortunately hindered by a less than ideal execution. The story, music and scenery are all above average, crafting a whimsical art deco world that’s incredibly delightful. However the core game mechanics suffer from inconsistent behaviour and glitchy collision detection turning the otherwise novel idea of moving through shadows into a laborious experience. 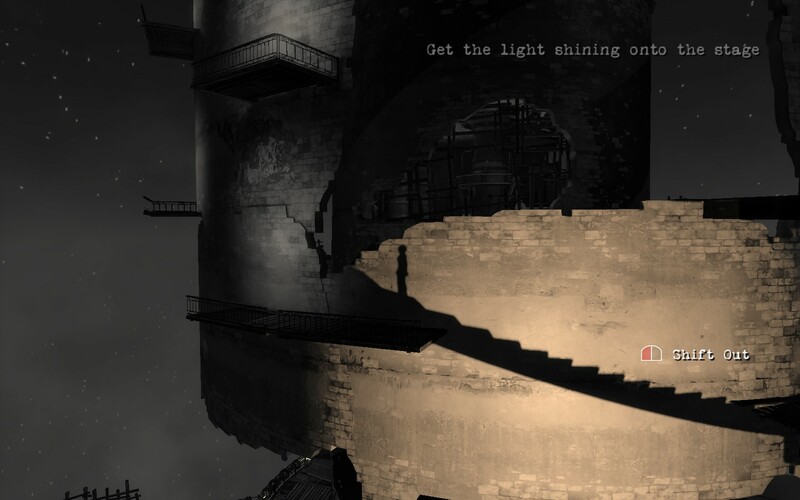 Lovers of indie puzzlers will find a lot to enjoy in Contrast however I think that’s the limit of its appeal, at least in its current state. Contrast is available on PC, PlayStation3, PlayStation4 and Xbox360 right now for $14.99, $14.99, $21.49 and $14.99 respectively. Game was played on the PC with 3 hours of total play time and 68% of the achievements unlocked.